Police report at least three people are dead after a gunman opened fire at a Pathmark grocery store in Old Bridge, New Jersey. NBCNews.com's Dara Brown reports. Updated at 5 p.m. ET: Three people are dead after an employee shot to death two coworkers before killing himself at a New Jersey supermarket Friday morning, authorities said. Police said the shooting happened just before 4 a.m. inside a Pathmark grocery store on Route 9 in Old Bridge, N.J., about 25 miles from New York. Police investigate a shooting at a Pathmark grocery store on Route 9 in Old Bridge, N.J., on Friday. The victims were 18-year-old Christine Lo Brutto and 24-year-old Bryan Breen, both from Old Bridge. 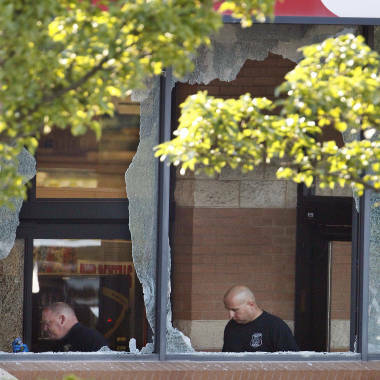 The gunman, Terence S. Tyler, was 23 years old, police said. All three were working the night shift at the Pathmark with 12 other employees. The store was closed at the time, scheduled to open at 6 a.m.
Police believe Tyler may have gotten into an argument with a coworker at the Pathmark before he allegedly left the store around 3:30 a.m. Police say he then went to his car, drove away and returned to the store about 20 minutes later, dressed in camouflage clothing and with a weapon similar to an AK-47 assault rifle. Police say Tyler opened fired on an employee standing outside the store, then went inside and fired at least 16 shots from the rifle at five employees, killing two people. He then killed himself with a handgun. Some employees ran out of the back of the store to escape, while police safely removed other employees after making entry into the store. No shots were fired by police. Authorities said the victims were not necessarily targeted, but the motive is under investigation. Officials recovered the rifle, several ammunition magazines and a 45 caliber handgun from the scene. Tyler was a former Marine, who earned several medals for his service between March 2008 and February 2010. At the time of his discharge, he achieved the rank of Lance Corporal. He was an Old Bridge resident and had been working at the Pathmark since Aug. 20. Police said Tyler may have had a history of depression and mental illness. The family of victim Lo Brutto, a recent high school grad, has asked for privacy. However, neighbor Carolyn Anders said Lo Brutto had a "heart of gold, always smile on her face." "Why does an 18-year-old have to lose her life? She just [began] it," Anders said. A vigil for Lo Brutto and Breen was planned for Friday night. 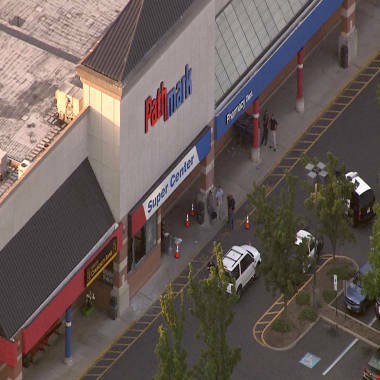 An aerial view of the Pathmark supermarket in Old Bridge, N.J., where a shooting that occurred at about 4 a.m. Friday left three people, including the gunman, dead. Employees who were in the store at the time of the shooting congregated later in the morning outside a TGI Friday's restaurant in the shopping center where the supermarket is located. New Jersey Transit closed its nearby park-and-ride lot, The Associated Press reported. Aerial news video showed heavily armed police on the ground outside the supermarket and several windows broken. The store was closed Friday. Pathmark officials had no immediate comment on the shooting. NBC News' Jonathan Dienst, Brynn Gingras, Brian Thompson and Katherine Creag contributed to this report.